Have a good old think about it… how good are you at solving those issues that leap across your path every once in a while? Now think again… would you give yourself the same score across all scenarios? Are you effective at solving problems whatever area of your life they appear in? What about problems at home? With your family? Concerning money? How about work? Or with your boss? Most of us – at some time or other – have inadvertently wandered into problem-solving complacency, only to be bitten on the bum later on down the line. For example, I once tackled a myriad of home-based issues without breaking a sweat. Human nature being as it is, I summarily judged the effectiveness of my ability according to this triumph and decided that yes, not only was I bloody marvelous at problem-solving, I should be presented with a problem-solving cape. Unfortunately, merely a week later, I was defeated by a tiny workplace hiccup when Doris (who’s been in charge of the stationery order since the stapler fiasco of ’87) forgot to order enough post-it notes. 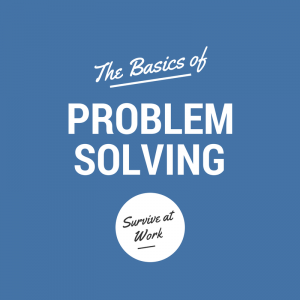 The fact is that not all problem-solving approaches are equal. The techniques we’ve organically cobbled together over many years of facing random problems, don’t always translate effectively to every situation. The effectiveness of your efforts. The likelihood of you coming up with a solution that works! How many times have you heard the following in your workplace? We’re all doomed. Doomed I tells ya. Okay, so perhaps not the latter, but you get what I mean. All too often, peoples perceptions of a problem are too vague. That’s why your first step needs to be problem definition: what’s the problem and what’s the impact? Your next step will be to analyse what you’ve just defined. Get stuck in – don’t rely on rumour or tittle tattle, go see that problem in action and start collecting some data and facts. What – what’s affected, what’s not affected, what’s the impact, what’s the expected standard? Why – why is it a problem? When – when did it start? Where – where did it start, where does it affect, where doesn’t it affect? Who – who’s impacted, who’s not impacted? How – how did it happen, how does the problem impact, how doesn’t it impact? Sparkly Tip: Stay away from blame – focus on action, activity and process, rather than people. Start with the earliest point in the process (and time) where the problem is apparent. Use the 5 Whys to funnel down the problem to the root cause. Resist the urge to steer your Five Whys according to your preconceptions and preferences. Keep an open mind! Keep asking yourself – could this be a symptom? Sparkly tip: If you’re left with more than one root cause, then you might need to revisit the process. Go back to Step 1 and invest further in your definition; then recommence the journey back to Step 3. Now you’ve located your Root Cause, it’s time to invest in a long-term resolution. In Lean, this is something called a “countermeasure” and is intended to permanently resolve the root cause you’ve identified from the problem you’ve already defined and analysed. Your earlier activities will have already helped focus your problem-solving thoughts in relation to the problem. Now you need to develop a plan to methodically implement – and sustain – the permanent resolution(s). If there are any caveats (e.g. everyone needs to do Y at point B), then put them in the plan. Cover all avenues. Sparkly Info: A Countermeasure differs from what we call a “Containment”, which is a temporary holding solution that we put into place to limit the problem while we invest in a permanent solution. You’ve got your resolution and you’ve got your implementation plan. Now all you need is to put it into place. If multiple people are required to sign up to the resolution, then make sure you speak to them – ensure they know what the resolution is, why it’s an effective resolution and why they need to follow the new approach. Ensure you’ve put measures in place to quickly identify if the resolution is working (or if it isn’t). Continue to check the effectiveness of the resolution – after all, sometimes time and peripheral changes can eventually change a once-effective solution into an ineffective hurdle. I agree with you, written like this it does. In reality, when you’ve traveled through the process once or twice, it becomes second nature and you’ll be following the approach without even thinking about it. Keith works in a call centre, answering an insurance claims line dealing with people who are claiming on their house insurance. One morning, he notices that all the calls he’s receiving are from new customers looking to join his company. He lets his line manager know. His line manager decides there must be an issue with something called the IVR – the software used to gather information from the caller and route the call to the appropriate person. She alerts her manager to this. Within an hour, all the floor managers are in a meeting discussing the problem. They decide they require the expertise of a calls analyst and IT technician. After 2 hours they are still unable to resolve the problem and so alert their senior manager to liaise with their external provider of call routing software. On the second day, a team of software experts are drafted into the call centre to investigate and solve the problem. They soon identify that the issue isn’t with the routing software at all… but that an inexperienced deputy manager had changed Keith’s personal call profile, so that he’d receive “new customer applications” calls instead of “house insurance claims”. Keith is not receiving Insurance Claims calls. Keith is receiving New Application calls. The issue started this morning and has not previously happened. No one else is experiencing this problem at this time. The next time you don your problem-solving cape and zoom off to solve the “problem”, keep this Problem Solving Model in mind… and ensure you permanently resolve the right problem, in the right way. In later weeks and months, we’ll go into more depth about specific tools and techniques you can use as part of the problem solving process… and optimize your efforts for maximum effectiveness.